The bitterness folds are lines which start from the corner of the mouth and descend towards the chin: their progression is gradual and inescapable. 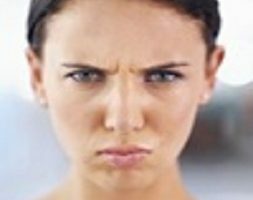 These are the most ageing lines for the face, and give the impression of an ill-temper. 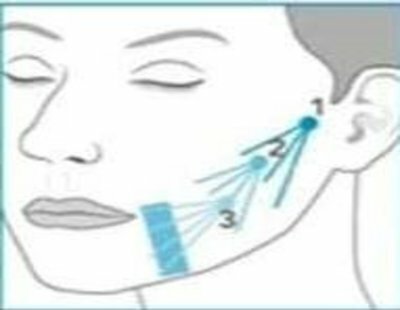 – The contraction of the facial skin muscles, notably the DAO muscle which pulls the corners of the lips downwards. – Skin sagging and the ptosis (fall) of lower internal fat. – The loss of support offered by the fat around the edge of the lips, and bone ageing. The progress of bitterness folds can be judged against a scale. Hyaluronic acid is used to lift fallen malarial tissue over time because it is responsible for the appearance of these folds. So do not directly inject the folds to avoid weighing down the face. If after the lift step the fold persists, it is injected. Depending on the severity of fold, a moderately reticulated Retylane type hyaluronic acid or a strongly reticulated Restylane Perlane type acid will be used. 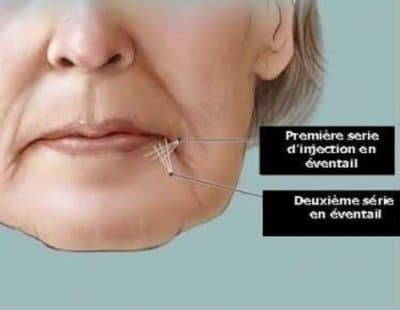 The injection is administered to the fold, and in an imaginary triangle placed under the labial commissure to give support to the edges of the lips, and to gently lift them. The product stays in place between eight months and two years, depending on the severity of the fold, the age of the patient and the product used. Threads improve or treat the bitterness folds by lifting the tissues. They are often associated with injections of hyaluronic acid because it is not enough to lift the fat (they can lift well than the skin) and ptosis is only one of the etiologies of these folds. A high level professional and exceptionally considerate. I was afraid of the pain (bitterness folds) but I practically didn’t feel a thing. I’m very satisfied with the result. I went for an injection of the bitterness folds. This doctor is great! Professional, very competent and knows how to satisfy her patients. I highly recommend her! A very attentive doctor, clear and precise explanations. Truly satisfied of the injections to treat my bitterness folds. Thank you Doctor.